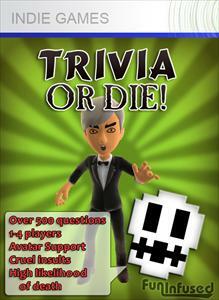 Trivia or Die is the fourth release from my game company Fun Infused Games. It was released on February 11th for Xbox Live Indie Games. We started work on this game way back in early 2010 as a break from working on Abduction Action!. It was tabled for months until after a release and a couple updates to Hypership Out of Control were completed. Getting the game up and running was very quick, I did the majority of the work on the engine in about a two week period. Polishing, adding Avatars, and writing the questions took up most of the rest of the development time. We were very busy with this game in December and January and casually worked on it before then for a month or so. Motivation for this title came from a love of playing trivia games but being unhappy about the slow speed of playing these games, seeing the same questions over and over, the quality of the questions asked, and not being yelled at by a stereotyped Japanese host. This was far and away my shortest developed games. The basic engine was finished in about two weeks and then there was another month or two just polishing the overall package. Much as with Hypership and Abduction Action!, getting the engine done and being able to really polish the game was hugely important to the high quality of the final product. Unlike my last few games, Trivia or Die is a bit slower paced and has less action going on. Because of this, I was able to code the game as I normally would and didn't have to dig into any performance testing or optimization of code. This was a big time sink on my previous games that I completely avoided. Once I was able to create a wrapper class for my Avatars, which I finished mostly in one night, using Avatars in Trivia or Die became extremely easy to do. Avatars are good to add some personality to your games and having a game with Avatars has likely helped increase trial downloads on the Marketplace. For Trivia or Die, I had two expenses (main game music and the music that plays on the kill screen). I used royalty free music for the menus and I did the in-game and box art myself. Everything turned out well at a very low out of pocket cost to me. Within one day of release, I'm making a profit on Trivia or Die. A year and a half after release, I still haven't made a profit on Nasty. Finally I got a game through on the first try (my other games have all passed on the third attempt). The XNA community was very helpful in looking for bugs with previous playtests and timely in reviewing Trivia or Die. It was awesome to be able to finish a game and have it up for sale two days later. I had hoped I'd be able to pass Trivia or Die in 48 hours and that did happen. This allowed Trivia or Die to be the first game listed on the New Releases list for Friday and some of Saturday. Weekends are peak traffic times for XBLIG. I was concerned about releasing when I did because of so many 3.1 titles backlogged (the 3.1 submission deadline was just about up so there many more games in review than there normally are). The fear was that a lot of games passing would quickly push Trivia or Die off the New Releases list. In actuality, I feel like the opposite happened. With so many games in review, the games just didn't seem to pass quickly. We got a full day and a half as the first game on New Releases and since then haven't dropped that far down. With just three days of sales to judge, so far sales have been better than I had hoped. These three days have been the three highest sales days I've had for any of my games (the second sales day was more than twice as much my previous high). Ultimately success will be measured on whether sales can stay high long term, but so far the results are extremely promising. At first glance Players and Artificial Intelligence seem like different things so I made the decision to make each their own unique objects. This was simpler in terms of setup and design but proved to be a hindrance when it came to implementation. Because they were different, unrelated objects, I always had two sets of objects to check scores for, draw on screen, etc. Had I made them one object type (or two object types inheriting from the same parent type), it would have simplified implementation immensely and removed a lot of duplicate code (I would totally fail code review for this). By the time I realized this was a bad idea, the work required to change the objects was more work than to just deal with it. I did a flaming pit plus screams and a funny, Wiley Coyote like fall into the pit. I think this worked well but I would really have liked to be more unique with the deaths. Avatar usage rules limited what I could do though so the less elaborate (and more gruesome) deaths I would have liked to have had didn't end up in the game. 500 questions was a lot to create (actually I believe the full amount is 509). It took a lot more time than I had anticipated and just getting questions done delayed the release of the game by a full week. I got very much burnt out on writing questions near the end of the process and that lead me to really dislike working on this game. It was a huge relief to be done. On my other games, I do all my development almost exclusively on the PC and only occasionally check on the Xbox for performance and compatibility issues. Because Trivia or Die uses Avatars, it forced me to do a lot more testing on the Xbox (Avatars don't draw on the PC). My main Xbox is in a different room than my PC so this also lead me to have to get up and leave the room a lot, not exactly the ideal situation for testing. I do have a second Xbox in my office but I didn't want to deal with the hassle of moving my Gold account (attached to my Creator's Club account) from one Xbox to another. In hindsight, maybe I should have. Honestly I got really sick of working on this game. Some of it was questions, some was Avatars, some was because so much of my time was spent tweaking transitions between screens and various intro and ending sequences. I found my platformer and shooter games infinitely more enjoyable to work on and couldn't wait to get back to those genres being the focus of my efforts. Also wanting to be done partially influenced my decision to release when I did as well as opposed to waiting for the review backlog to clear. It's really nice to finish a game and be able to speak of success and good sales. I've been told a couple times now that Trivia or Die is the best trivia game on XBLIG (it's a bit of a niche market so there is not a ton of competition). Sales have been really fantastic so far. I am unsure if they will stay high for the longer term and that will be the real judge of success for Trivia or Die. I believe Trivia or Die will easily be my second highest selling game and potentially could be my highest selling game by a significant margin. Ask me in a week and I'll have a much better idea. This article has been view 1251 times.